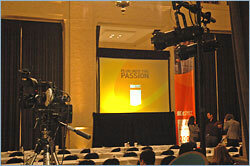 Description: CNET needed an event company to facilitate the 2007 Sales and Marketing Conference at the Old Federal Building in downtown San Francisco. CEO, Neil Ashe would address over 375 people at the event. Budget, timing and accommodating over seven speakers, one musical band, a six person question and answer panel, and nine different video and power point presentations was of utmost concern to the company. Action: Pinnacle was selected as the primary vendor to supply the audio amplification, video payback and recording, video projection, lighting and staging needs. Coordination with Marketing, Sales and Executive staff was of highest concern to maintain piece of mind and proper event implementation. Result: Pinnacle Communications executed in perfect fashion the needs of CNET. Providing for a worry free, streamlined, under budget, top notch experience for the attendees and CNET business channels. "It was a real pleasure to work with your team. You guys were patient and accommodating from the start. Thanks for helping make our conference a success."